You can find examples of recent work on Instagram. Buy prints and original art at my Etsy shop. Drawing puts me in the zone. I am more likely to make the world a better place when I am working in the zone. In the past, drawing has occupied a prominent but purely recreational role in my life. Your patronage bridges the gap from hobby to professional practice. Keep me in the zone. Plus, in return for supporting my work, I send you postcards! 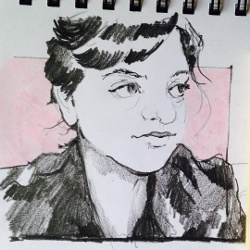 I send portrait studies and other sketches to my patrons. I get practice and you get cool mail to stick on your fridge. If you like my drawings, send a couple bucks my way. Expect postcards to lead adventurous lives. They might get wet, bent, burned, torn, smudged, or embellished by creative postal employees. 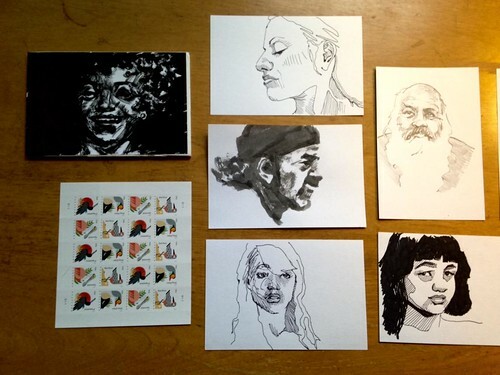 Postcard sketches are selected randomly. You can ask for something specific, but I'd rather surprise you. The sketches I send as postcards are indeed originals. Sketches are practice drawings. Detail, composition, and style vary. I retain the right to reuse and display images of my artwork for any purpose. Postcard pledges can be designated as gift subscriptions! Enter the intended recipient's mailing address when submitting your pledge, or send me a direct message later with details. I send you a random original sketch every month. 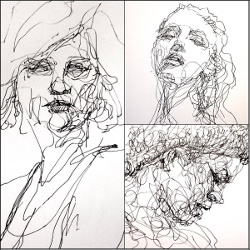 Subject and media vary but are most likely to be ink or pencil portrait studies. 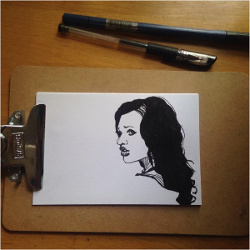 Drawn on 4×6" cards. I send you a random original sketch every week. Four postcards a month! 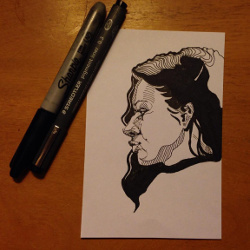 Subject and media vary but are most likely to be ink or pencil portrait studies. Drawn on 4×6" cards. Weekly postcard patrons will receive a complimentary magnetic display sleeve suitable for showcasing a favorite sketch on your fridge.